During the transport and storage of the pipes and joints it is necessary to take suitable precautions to avoid the danger of damage and contamination of dirt and humidity inside them. During transport and storage it is necessary to pay due attention to temperature variations that may cause condensation to form and are particularly harmful to carbon steel. Contact among stainless steel pipes and carbon steel pipes is to be avoided. 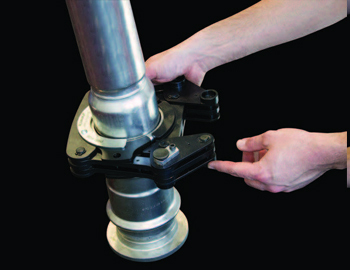 The same consideration also applies to the storage of the fittings. 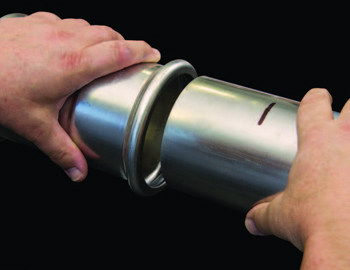 The handling of pipes must be done individually to avoid any scratching. 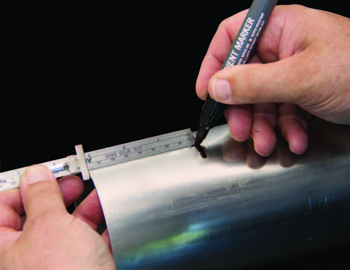 CUTTING:Cut the pipe using burr free approved cutters. 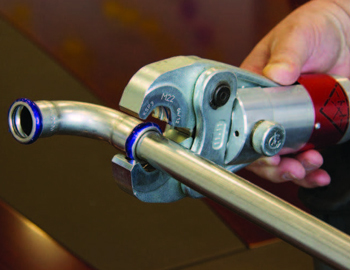 Do not use oxy-acetylene or abrasive cut off wheels.Pipes must be cut at right angles to their axis, using a pipe cutter or fine-tooth saw, taking into account the depth of insertion into the fitting. 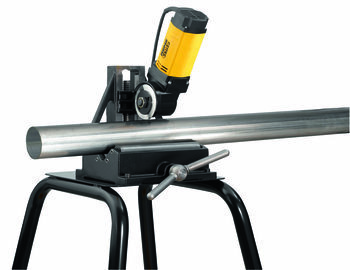 DEBURRING:All pipe cuts must be carefully deburred, both inside and outside, using a manual or electric deburring tool. 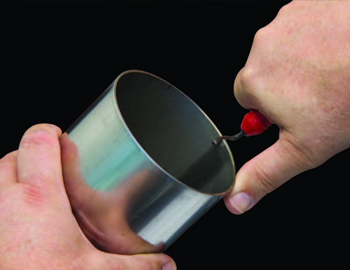 Any cutting residue (swarf) must be removed to preclude damage to the O-ring when the pipe is inserted into the fitting, avoiding possible leaks. 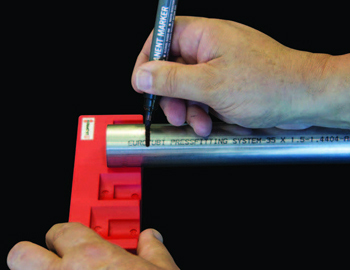 WITNESS MARK INSERTION DEPTH:To ensure a correctly inserted joint the pipe must be marked with a fine-point felt -tip pen where it meets the fitting using the Europress depth gauge so that full insertion can be verified. 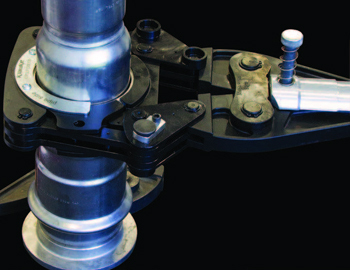 PRESS TOOL & JAW :The pressing tools must be equipped with M-shaped profile jaw attachments or pressing jaw corresponding to the diameter of the fitting to be pressed. 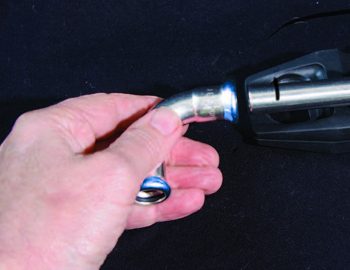 Retract the lock pin, position the jaws into the tool head and ensure the lock pin is fully engaged. 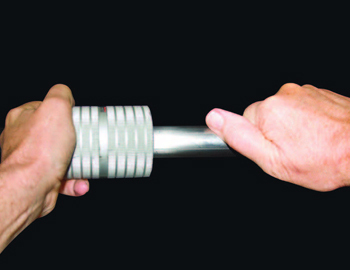 POSITION PRESS JAW :Open the jaws by squeezing the two ends together, then position jaws over the fitting so that the internal channel of the jaws form a perfect fit round the toroidal seat of the fitting. Release the jaws and check for a snug fit. Check L.E.D. light after each press. If it comes on,battery must be recharged or changed before attempting the next press. See trouble-shooting guide. 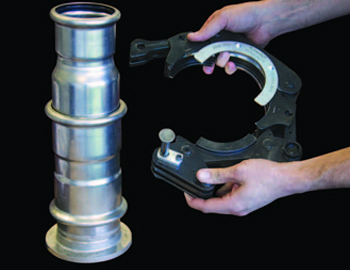 ATTACH PRESS COLLAR :The pressing collar must be M- shaped profile corresponding to the diameter of the fitting to be pressed. 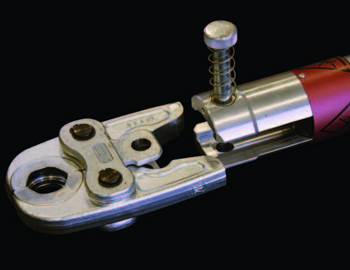 Retract the lock pin, open the jaws and position the jaws around the fitting. 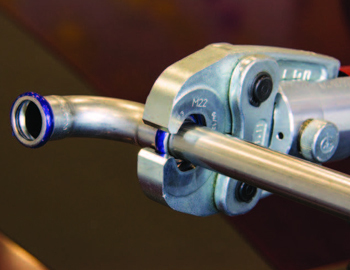 LOCK COLLAR :Ensure that the internal channel of the jaws form a perfect fit round the O-ring seat of the fitting. 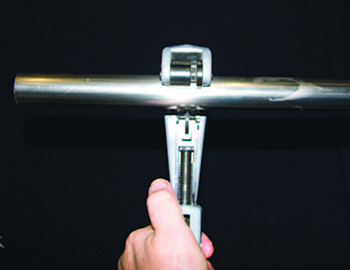 Ensure the lock pin is fully engaged. 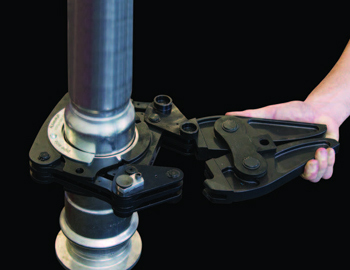 ATTACH ADAPTOR :Squeeze the back of the adaptor arms together and hook onto the pressing collar. 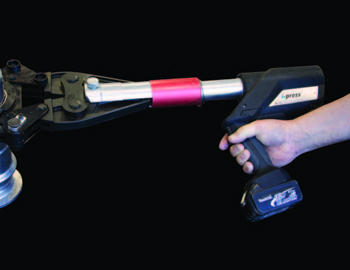 CONNECT PRESS TOOL :Retract the lock pin, engage the adaptor and make sure lock pin is fully engaged.